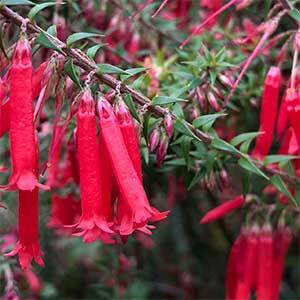 Epacris impressa – Pink Flowering form. With very attractive bell shaped flowers that hang beneath the foliage, Epacris impressa is sometimes called the Common Heath. 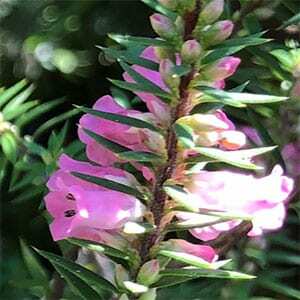 It grows over wide areas of south eastern Australia and with the main flush of flowers being in winter it makes a very useful addition to the garden. The flowers attract nectar seeking birds and bees to the garden as well as being bright and cheerful. Flowers do range in colour depending on the form, from pink through to red. A white form is also available. E.impressa var.grandiflora, found in western Victoria has larger flowers than the other forms. The pink flowering form is the Floral emblem of Victoria. This is plant that makes a good feature plant in the garden or in a container. In a well drained soil and a position with good morning sun Epacris impressa is easy care. It can be grown in a container and is suited to smaller gardens. In areas with clay or wet soils it is best to hill up or mound the soil and plant into this raised area. It is not suited to areas with high humidity. Propagation is from seed or from semi-hardwood cuttings. Very little pruning is required, light tip pruning can maintain a more bushy habit if needed. The flowers can also be cut for indoor use. Botanical Name – Epacris impressa. Position – Sun to Part shade. Soil – Well drained with some moisture during dry summers. Sandy loam suits well. Fauna – In flower it will attract nectar seeking birds to the garden.